Wish lists has been around for a long time, probably since the beginning of history. They are often utilized by children around the time of birthdays or Christmas in order to let their parents, family, and friends know what they are hoping to receive as gifts. For some time now, Amazon.com has had a great feature on their popular book retail website - the wish list. Whenever I am reading a book, attending a conference, watching a TV program, or browsing the web and I run across a recommendation for a book, I always pull up the Amazon site and add that book to my wish list. When I have some money saved in my budget to purchase some books, then I'll revisit my wish list and order my highest priority books. I am currently in a difficult time of life where I need to hold the line on a very tight budget in order to cash flow some current and future expenses in the next few months. At the same time, though, I have some "needs" and wants that I could pay cash for today, but I am very hesitant to spend the money on the these things at the current time. 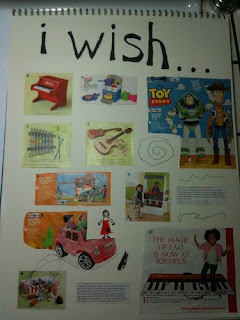 My solution: build my own personal, prioritized wish list. To be honest, the majority (most likely all) of the items on my list are really wants and not needs. I can survive without difficulty if I don't purchase these particular items from my list. But, I've added some items that I know would be helpful to have for what I do for a living, such as purchasing a couple of new business suits, because the couple of suits that I currently own are really wearing out! Conquering impulse purchases. For the most part, I have never really been plagued by impulse purchases, but I know many people in our society have this struggle. Through the process of placing a material need or want on a wish list and waiting, we can avoid an impulse purchase that we will probably regret later on. Increasing patience and contentment. Interestingly enough, when we wait to make a purchase, big or small, we grow in patience and contentment. We learn that we can "survive" without more material possessions. Exercising restraint and self-control should be a hallmark of an adult, right? Allowing God to work. Putting an item on a wish list can be an opportunity for God to provide for you in supernatural ways. Many times, though, we circumvent God's provision by getting into a hurry. Why not convert a wish list into a prayer list? Through this process, we may decide that the stuff we are praying for may not be what we truly need. Building anticipation. When I look back on my childhood, do you know what I think was the best part of Christmas? Anticipation! To be honest, I really only remember a handful of the gifts that my parents had purchased for me, but I certainly do remember that sense of breathless anticipation as I awoke early each Christmas morning in order to unwrap presents. That was fun! Becoming more resourceful. If you don't have the money to buy the things you may want or need, perhaps you could get by for a time with a less expensive substitute? Or, maybe you could barter time and talents to get something you need. Get creative. Saving money. In the end, being patient, praying over your list, allowing God to work, and becoming more resourceful will save you tons of money. This saved money can be better used for your family and God's Kingdom. Have you ever created a wish list in order to accomplish the above? If you have, what was the end result? I'd love to hear your story. I really appreciate and identified this article and I don't have the end result to share as of yet. For Christmas 2007 I gave my husband a "DREAM" notebook of everything we talked about that we would like to have or do which including the following: Getting our pilot's licenses, returning to his home of his youth - in Portugal, returning for a second mission's trip to Laos, buying a motorcycle, buying a home large enough for us to adopt several children, buying 2 new vehicles (ours were 11 and 12 yrs. old at the time, and actually still running) and putting our youngest son in private school. We refuse to go into debt for any of these things. God opened many doors for us and because of this dream list we have taken lots of baby steps. We found a local Cessna Flight School and save up for a monthly 1 hour lesson which we split. We visited a church when we moved and found out they had an amazing K-12 school. They needed a helper so I work there 3 days a week which pays for our son's tuition. He's now in his 2nd year as a high school sophomore. We contacted my husband's old school and church in Portugal and the director told us they would be very excited to have us stay with them next summer. YEAH!! We have filled out our passport applications (my husband lost his) and we have been putting money back for the plane tickets. As far as the new vehicles and motorcycle, we have test driven LOTS of cars and read every piece of information we could get our hands on. After deciding on the exact cars we need we put it in God's hand for His timing as to when we will have them. God showed us a home that we have both fallen in love with is in the same town we live in but in the country on 33 acres and 6 bedrooms. The homeowner just lowered the asking price by $300,000. WOW God is up to something!! So, I'd like to sum up by saying that creating a "Wish List" is a PERFECT way to sit back and watch God work. Oh yeah....by the way, we've been able to do all the above on only a $22,000 annual income, MUCH less than we used to make. We've also been able to help a Filipino christian family start a home business or selling rice so that they and other families in their village could eat. They lost over a ton of rice we bought for them due to the recent tsunami. Praise God for His provision. GOD IS GOOD......ALL THE TIME!! What an awesome continuing story of God's faithfulness to you and your family for allowing God to work in your financial life. Way to go!